1859 is one of the great years in the history of science: the Englishman Charles Darwin expounded his ideas on the origin of species, and so cleared the way for the theory of evolution; and in that same year, the Scottish physicist James Clerck Maxwell (1831-1879) published his Kinetic Theory of Gases, in which he introduced the statistical account of molecular motions and their mathematical treatment known today as Maxwellian distribution and contributing to our fundamental knowledge of physics. In the same year, Maxwell, then 28 years old, presented his Theory of Colour Vision, acknowledged as being the origin of quantitative colour measurement (Colorimetry). 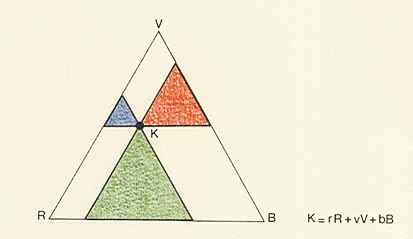 In this work, Maxwell demonstrates that all colours arise from mixtures of the three spectral colours — red (R), green (here abbreviated to V [verde]), and blue (B), for example — on the assumption that the light stimulus can be both added and subtracted. He allocates each of the three main colours to a corner of a triangle, into which we have then placed a curve of spectral colours which is provided with technical data. A line of this type will reappear later in the CIE System. This is important, because all associated insights go back to Maxwell who, with his triangle, introduced the first two-dimensional colour system based on psychophysical measurements. It is difficult to explain to the outside observer just how famous Maxwell is amongst physicists. In addition to Maxwellian distribution (see above), his name is also associated with the four so-called field equations which are able to explain how light propagates, and point to the existence of electromagnetic waves. We make use of the reception of these waves today, for example when we listen to the radio. Maxwell showed that light waves are to be understood as oscillating electrical and magnetic fields, and he explains how light waves can travel across the vast emptiness of the universe and reveal the stars. Maxwell’s observations of colours are based on propositions made by Thomas Young, who had already noted that no more than three colours of the spectrum were required in order to bring all others into being. 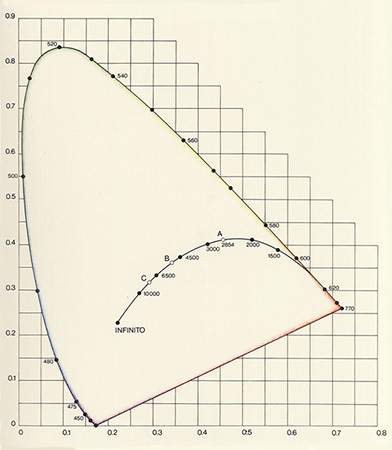 At the time when Young submitted his trichromatic theory, many artists had long known that they could mix all colour shades by using three primary pigments; physicists, however, were still influenced by Newton’s claim that the seven colours emanating from a prism are elementary (and therefore not mixable). Young’s three receptors gained in credibility when, in 1855, George Wilson of Edinburgh presented the first statistical analysis of colour blindness. In the appendix, Maxwell was able to show that the observations made sense if the individual concerned was assumed to have one or two receptors that were ineffective. Maxwell had begun his own experiments into colour mixing at Edinburgh, in the laboratory of J. D. Forbes, who worked with rapidly rotating discs. Using this method, Forbes wished to mix the spectral colours to create grey, and was unsuccessful in his attempts to mix grey from red, yellow and blue. He soon saw why: under these circumstances, blue and yellow do not result in green, but rather a kind of pink. As a result, Maxwell chose red (R for rosso), green (V for verde) and blue (B for blu) as his basic colours (clearly stressing, however, that any other trio of colours can be selected which combine to give white). We find these basic colours again in his triangle. In his experiments into the measurement of colour, Maxwell engaged test subjects, who judged how the colour of a sample compared with a mixture of the three basic colours. Nowadays, the test subjects are themselves allowed to change the mixture of red, green and blue (with the aid of standardised light sources) until the impression of the colour corresponds to that of the sample («colour match»). The respective proportions of the mixture can be recorded using three numbers, identified as R, V and B and known since Maxwell’s time as «tristimulus values». Maxwell now became aware that the brilliance of a multicoloured surface is relatively insensitive to changes in brightness, and was able to totally eliminate this as a determining factor by introducing new parameters r, v and b, arrived at by dividing each tristimulus value by their total value: r = R/(R+V+B), v = V/(R+V+B), and b = B/(R+V+B). These new colour coordinates fulfil a simple condition-their sum is one (r + v + b = 1). This means that all their possible combinations can be represented as the points of an equilateral triangle-the Maxwell triangle. A few examples can be seen in the series shown to the right; here, the white neutral point is located in the centre of the construction. 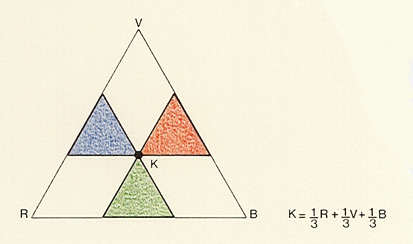 Since their tristimulus values, or their colour coordinates, add up to one, the triangle enables us to predict the result of a mixture of two colours (triangle 1 — triangle 2 — triangle 3). All possible combinations of any two colours will lie on the line connecting their respective positions within the triangle. Naturally, Newton’s circle had already specified the results of colour mixing. 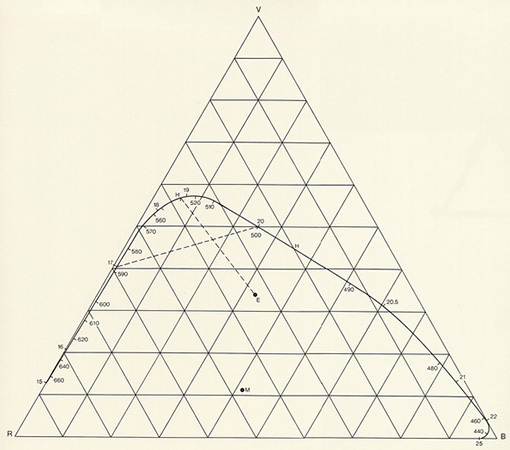 But Maxwell’s achievement was that the geometrical relationship and spacing between the colours in his triangle have a precise meaning, based on psychophysical measurements. In his colour mixing experiments, Maxwell was able to demonstrate that Newton’s circle of seven colours, with white as a middle point, implicitly satisfied the trichromatic theory since it equates to a model which allocates a point within a three-dimensional space to each colour. On entering the experimental results into his colour triangle, he located a point for white. With the aid of this point, Maxwell was able to specify three new variables — similar to H. von Helmholtz — which characterise a colour: the «hue», the «tint» and the «shade». Maxwell also showed how easy it is to form a link between these variables and portray colours as the sum of three primaries. 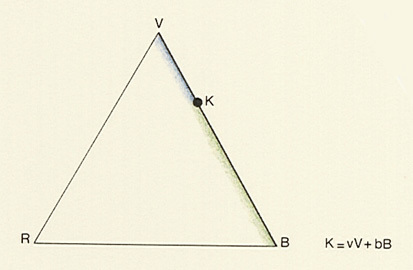 The limitations of this triangle, incidentally, soon became apparent: its values are based on comparisons of pigments, but the light of spectral colours can be much more intense. For example, if we seek the location of saturated yellow, we will see that it must lie outside the line between V and R. If all the spectral colours, together with the purple hues, are to be recorded in Maxwell’s diagram, then his triangle must either be extended or reconstructed. An attempt at this dates back to Helmholtz (illustration). Nowadays, we resort to a sophisticated method where the line in the triangle is already attuned (CIE System – illustration). Even today, because machines alone cannot distinguish between yellow or red, the measurement of colours continues to be a difficult task. As always, the human being is alone in his ability to decide. It is into his eyes that light falls, and from his eyes that the world is viewed. Date: James Clerck Maxwell, the physicist, presented his theory of colour mixing between 1855 and 1860. Application: The system is a fundamental requirement for colorimetry. 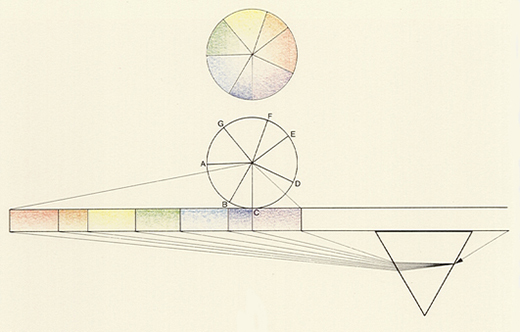 Bibliography: J. C. Maxwell, «Experiments on colour», Transactions of the Royal Society Edinburgh 21, pp.275-298 (1855); J. C. Maxwell, «On the Theory of compound colours», Philosophical Transactions 150, pp. 57-84 (1860); E. G. Boring, «Sensation and Perception in the History of Experimental Psychology», New York 1942; C.W. F. Everitt, «James Clerck Maxwell Physicist and Natural Philosopher», New York 1975.